Guerrilla-style hit and run tactics were further refined with the use of cavalry units during the Civil War. Men on horseback with revolvers and repeating rifles could surprise and outgun much larger infantry forces that were mostly armed with muskets. Then they could withdraw quickly and disappear into the wilderness. 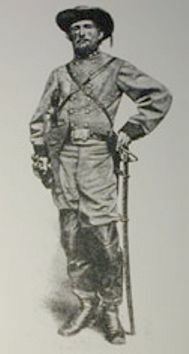 Colonel John S. Mosby led a band of Confederate soldiers called Mosby’s Raiders behind Federal lines in Northern Virginia. Because of his ability to hit Union supply lines and then disappear into the countryside, he was given the nickname, The Gray Ghost. He so dominated the area militarily that it became known as Mosby’s Confederacy. In 1863, he and 29 of his men captured Union General Edwin H. Stoughton at the Fairfax Court House. Legend has it that the General was roused from his bed with a slap on the rear end. On another occasion Mosby nearly captured the train on which Union General US Grant was traveling. Mosby and his men were paroled at the end of the Civil War. He supported his former adversary, US Grant when Grant ran for the presidency in 1868, because Mosby believed Grant was the best man to restore the South and heal the union. Because of his distinguished war record, he was encouraged by Southern leaders to run for elective office but he declined. Later, President Rutherford B. Hayes named him the consul to Hong Kong and he served in that post with distinction. Mosby practiced law in San Francisco after his return to private life. William C. Quantrill led a band of pro-slavery raiders in Kansas and Missouri before the Civil War. After the war started, he and his men were sworn into the Confederate Army and he was given the rank of Captain. In 1863, Quantrill led his 300-plus followers in a violent attack on Lawrence, Kansas, burning the major buildings and killing or executing between 150 and 200 men and boys in the town. Later that year, Quantrill and his men disguised themselves in Union uniforms to launch an attack on the Union outpost at Baxter Springs, Kansas. Quantrill’s brutal tactics earned him a reputation as a cruel and vicious leader. Union Generals were determined to stop him and in 1865, Quantrill was shot in a surprise attack by Union guerrillas. He died a month later, at the age of twenty seven. Union General John C. Fremont organized a special ops group called Jessie's Scouts, named after his wife, the former Jessie Benton. They often wore Confederate uniforms and operated in Western Virginia and the Shenandoah Valley where they conducted raids on communications and supply lines and carried out assassinations. At the end of the Civil War, Confederate President Jefferson Davis and other leaders wanted to continue the fight as a guerrilla war, but most of the Confederate generals opposed them, including Robert E. Lee who considered that course of action to be dishonorable. Many of the men who had fought with Quantril and Mosby were unwilling or unable to return to civilian life. They became some of the eras most notorious outlaws; like Jesse and Frank James, Cole Younger and his brothers, and the Dalton gang. After the Spanish-American War of 1898, the United States found out what it was like to be on the other side of a guerrilla war when it took control of the Philippines and fought an extended war against Philipino guerrillas like Emilio Aguinaldo, and the Moro bands. The rebellion was quite bloody and there were many atrocities on both sides. After three years, the US managed to put an end to the insurrection, but the war took it’s toll on US idealism. Mark Twain proposed the US design a new flag for it's new Philippine province, "just our usual flag, with the white stripes painted black and the stars replaced by the skull and cross-bones."